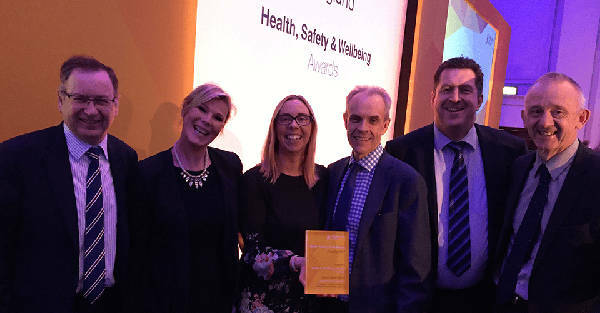 GRAHAM Construction's staff health and wellbeing initiative, known as Connect Plus, has been awarded a major grant from government to help its implementation throughout the company. Following a trial last year of around 20% of staff, a company-wide roll-out is planned at a cost of £1m. HR director Michael Smyth (pictured below, fourth from left) told delegates at the Road Safety Markings Association's conference that 'the Government has realised we are doing something innovative and have given us a 30% grant to do that'. Mr Smyth explained: 'Good wellbeing is good business. We sent all our employees off once a year for a voluntary health check. It is anonymous, but the data we had coming back told us that 70% of our employees were a heart attack or stroke waiting to happen. The scheme builds upon the earlier Connect health and wellbeing project and together it and the Connect Plus trial produce some 'fantastic' results. 'Staff turnover went down by 33%, lower than the industry average. Absenteeism decreased by 100% in two years and is now 400% lower than the UK average. Employees and managers were telling us it was fantastic and driving benefits in terms of career planning and relationships. 'An external survey on the Connect Plus pilot showed 85% felt it was excellent, 80% signed up for personal wellbeing changes, and 70% took part in additional sessions. GRAHAM secured Investors in People gold in 2014 but wanted even better results in terms of attraction retention and engagement. Mr Smyth under instructions from the board to improve the company's offering, brought together people from his HR department, from operations and health and safety and we came up with the foundation of Connect - the flagship personal development programme. 'Connect was driven by the fact that the traditional appraisal system had broken down,' Mr Smyth explained, outlining an intermittent, tick box system, led by managers who preferred to be on site and 'were good at building things but not good at managing people'. 'First of all we set out a standard wellbeing framework – basically a simple checklist of things you can expect in terms of wellbeing, no matter where you are. You will get a health check, access to support, a toolbox for education, for instance,' Mr Smyth said. Then GRAHAM developed its own 'well hub' - an intranet wellbeing site. Instead of the normal appraisal system, Connect sees a manager sit down with an employee on a regular basis and have an informal chat. Together they develop a plan based on the employee's ambitions and the companies and where they can go together. Then in late 2016, GRAHAM sought to develop the system even further to create Connect Plus, which was 'driven by the concept of whole person development'. Mr Smyth said: 'If someone is going to be at their best they have to have the right skills, they have to have the right behaviours and resilience, and they have to be physically and mentally well. It's only when you have all those things in the right place will you get the best performance form the individual. 'We needed a system that would analyse where people were against each of those areas, and we were going to develop where their gaps were and review where that made an impact for them and the business. GRAHAM asked all employees to do a personality profile. 'This gave everyone an awareness of themselves and an awareness of others. We trained our managers in terms of how to use that personality profile and understand their employee. People were getting access to training in emotional intelligence and mindfulness really leading edge things. In conclusion, Mr Smyth suggested that Connect worked because it was a tool centred on the individual.